This is the second article discussing some background to 152 Shanley (first article is here). 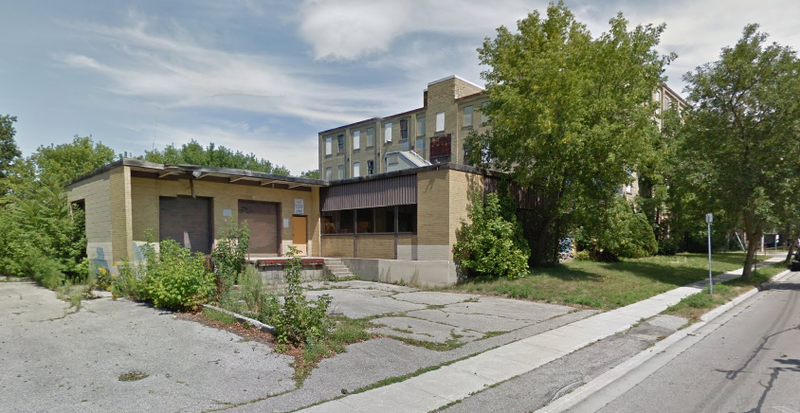 As mentioned in the first article, the building is coming up for a tax sale; the owner owes outstanding taxes, money to the city for work done on the property (snow removal, tree trimming, garbage removal) and money owing to the Ministry of the Environment for various assessment work. The total amount is over $800.000. These articles are written with information provided in our meeting with the city in August. –Bricks have fallen off the side. Does this mean the building is going to fall down? In 2012 a few bricks fell off the top of the wall and the top also fell in slightly. This event was documented in an earlier Blog posting. Some neighbours have also reported that “someone they know” was inside the building at some point and a couple of support columns were apparently unstable. One of the people at our meeting works in the city building inspection area. He reported that the reason the top of the wall lost bricks and fell inwards was because of the deterioration of the roof, and not anything structural with the building itself. The roof had several holes and was structurally weak around the side where the damage occurred. Since this happened, the owner has repaired much of the roof so no more deterioration will occur. The owner also erected a fence around that area to prevent people from walking next to the wall. The city has also hired a structural engineer to look inside the building and they have determined it is structurally sound. There have been some repairs made inside by the owner, so there are no columns about to fall down. –In places the surface of the building look like brick is falling apart, are you sure this is safe? The walls are 12 inches thick, so despite some of the exterior brick peeling, the structure is sound. –What is the owner allowed to do with the building? Can he ‘sell stuff’ like we have seen? Can he run a business out of it? There are many issues here, but the main one relates to zoning. The building was originally zoned “mixed use” but that has lapsed due to time and the contamination problem. No retail activity is allowed there. The owner is allowed to use it for storage and he can invite people in but they are not allowed to live there. In August 2013 the owner was selling some of the building’s contents off the back loading dock area. ByLaw was contacted about this, and their answer was that everyone is allowed one or two yard sales a year and they allowed the owner this right so he could sell some of the building’s contents. Apparently he continued to sell various goods more than two times and after ByLaw was alerted, he was forced to stop. If residents believe there is illegal activity occurring in the building, they are encouraged to call ByLaw (or possibly Police). However, ByLaw is overburdened with various complaints as discussed in this Record Article. They are not always able to respond immediately. And because of the time and expenses they have already devoted to the building, they will not perform actions like mowing the lawn or cleaning up garbage which is the owner’s responsibility. They will always take people’s complaints and contact the building owner and they will undertake action if public safety is threatened (e.g. sidewalks are filled with icy snow, materials are falling from building in an unsafe manner etc.). There are ongoing concerns about garbage piling up behind the building and glass and wood from the boarded up windows falling and there is no simple solution. ByLaw has been very helpful with many of these issues when they are alerted, but they have limited resources. –Why doesn’t the City just buy the building? Why doesn’t the city buy the building and tear it down? The city is currently owed around $800,000 in taxes. If they bought the building they would be rewarding the owner for failing to pay taxes and they would be responsible for cleaning up the contamination, which will cost much more money. The building cannot simply be torn down because then the contamination would still be there. The best solution would be for a developer to purchase the building and develop it into a condo property (or other commercial enterprise). It is in a prime real estate area within walking distance of the planned transit hub. The developer would clean up the contamination under the property and have some of those expenses offset through various Brownfield incentives. The city is committed to working with any developer to make the property’s development a success. They have proven their commitment to improving Kitchener by working with may businesses downtown and throughout the city. It is not certain that anyone will purchase the building when it comes up for tax sale. However, there has been interest in the building in the past despite the many issues attached to it. So the MHBPNA is hopeful something will happen in the next few months. That building has been an eyesore to this neighbourhood for years and it would be wonderful to see some sort of development happen there. Yes, we are hopeful something will happen in the next few months. The city should just take it the building clean it up and make it into a goverment housing or something… Even if the building is worth more then what is owed, they still need to clean it up so it evens out…. ANY THIRD UPDATE? I guess the "third update" is that the building went up for a tax sale in May of 2017 and that was not successful.